Distributed by the Standard Caramel Co. of Lancaster, PA, the predecessor to Hershey's, the E93 baseball card set resembles several other candy company card sets of the time period and contains just 30 cards, 18 of which are Hall of Famers, with a checklist on the reverse. Offered here is a collection of 29 cards from the E93 series POOR to FAIR overall with 22 different that features Hall of Famers Bender, Brown, Clarke, Collins, Jennings, (2) Joss, Lajoie, McGraw, Plank, (2) Waddell and C. Young. 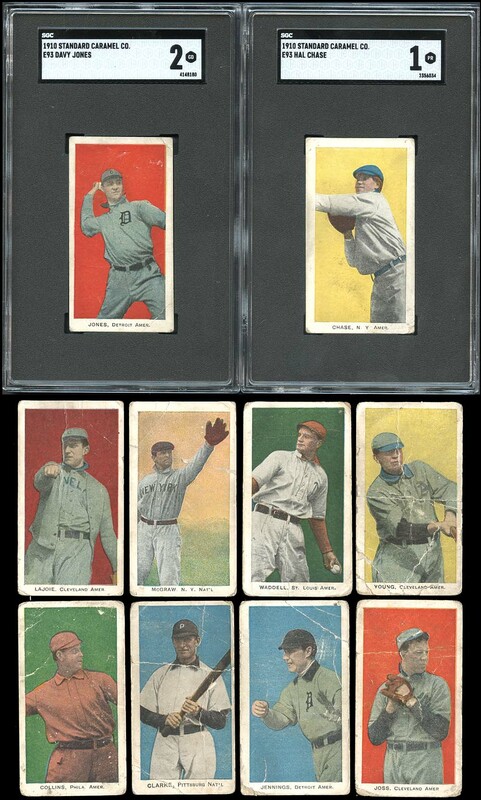 Also includes Ames, Chase, (2) Coveleski, (2) Delehanty, Dooin, Gibson, (3) Leach, Pastorious, Philippi, and Wiltse with two SGC graded cards: SGC 2 Jones and SGC 1 Chase. 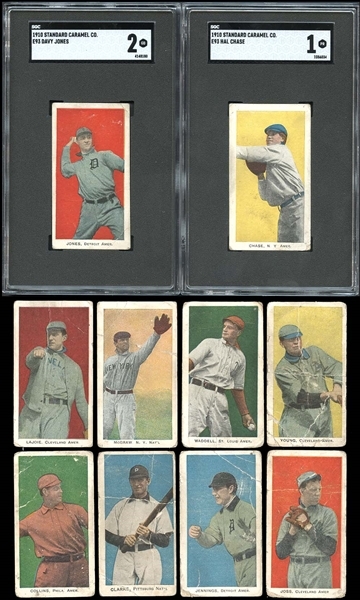 Needed to complete the set is Chance, Cobb, Donovan, Evers, Griffith, Mathewson, Tinker and Wagner.